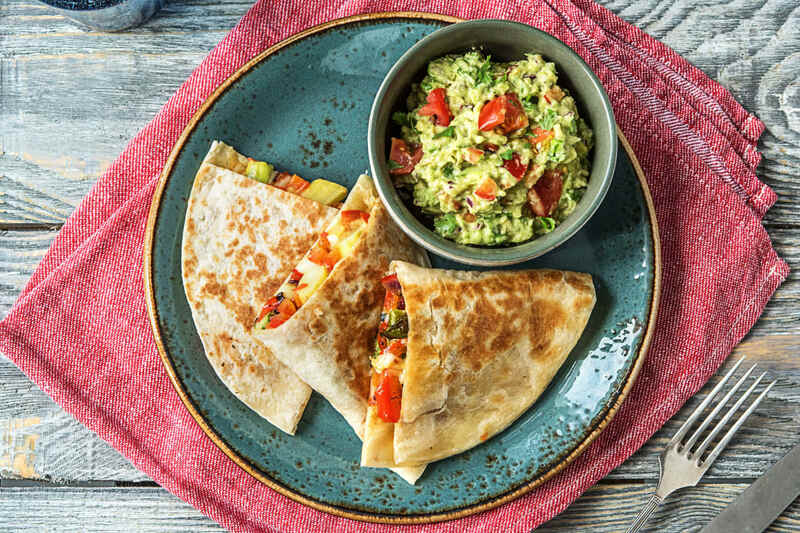 In our book, quesadillas and guacamole are the ultimate comfort food. Stuffed with lightly caramelized asparagus, bell pepper, and onion, these whole-wheat quesadillas are both hearty and wholesome. A secret layer of chipotle mayo will forever change the way you make quesadillas. Preheat the oven to 450°F (to roast the veggies). Start prepping when the oven comes up to temperature! PREP Wash and dry all produce. Core and thinly slice the bell pepper. 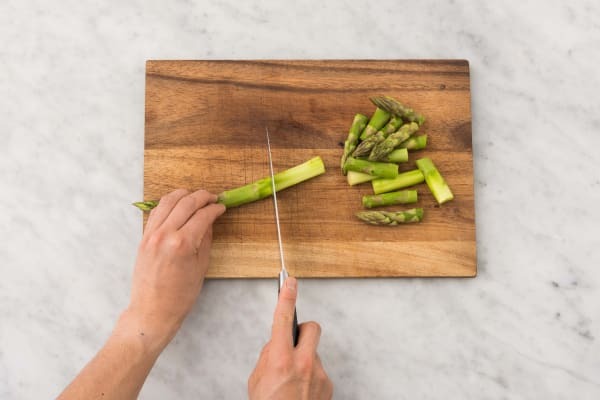 Cut the asparagus into 1-inch pieces. Finely chop some of the red onion strips until you have 2 tbsp chopped red onion. 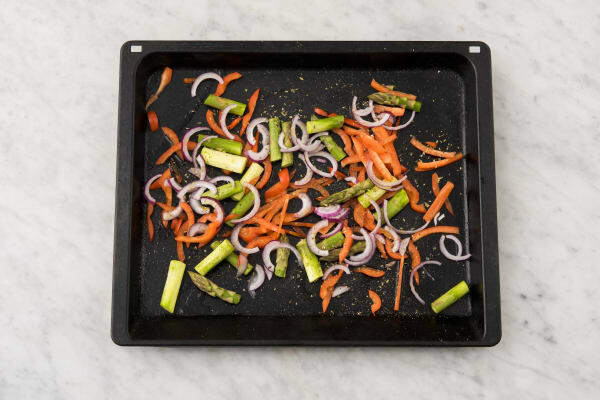 ROAST VEGGIES Toss the bell pepper, asparagus and remaining red onion strips on a baking sheet with the dried oregano and a drizzle of oil. Season with salt and pepper. Roast in the centre of the oven, stirring halfway through cooking, until veggies are golden-brown, 18-20 min. MAKE GUACAMOLE Meanwhile, finely chop the cilantro. Zest, then juice the lime. Cut the tomato into 1/2-inch cubes. Peel and cut the avocado into 1/2-inch cubes. 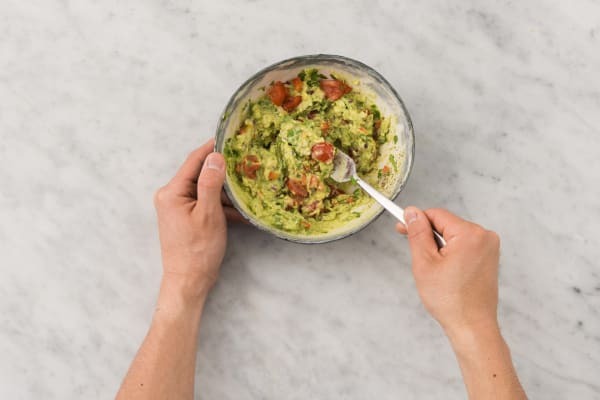 In a medium bowl, mash the avocado, lime zest and 1 tbsp lime juice together using a fork. Stir in the tomato, chopped onion and cilantro. Season with salt and pepper. MAKE MAYO In a small bowl, combine the mayo with as much chipotle powder as you like. 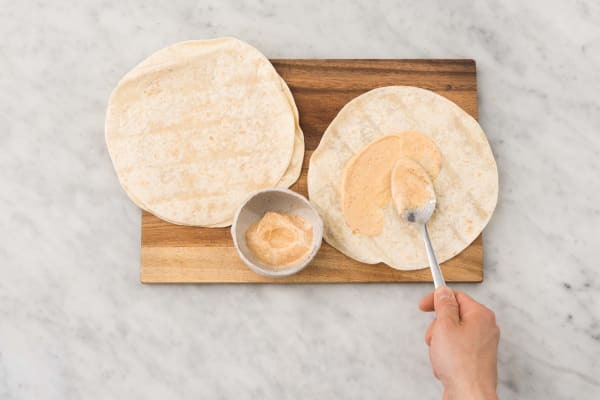 Divide the chipotle mayo between tortillas and spread to the edges. 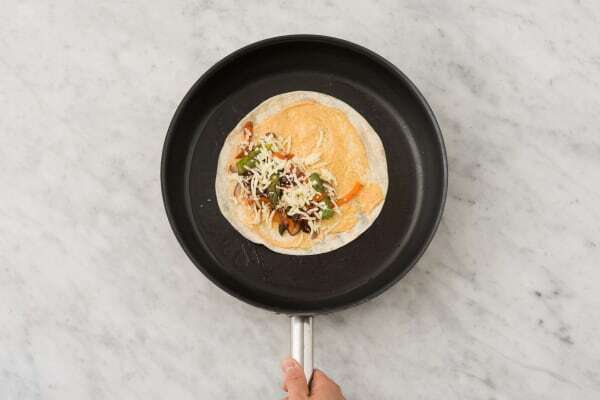 COOK QUESADILLAS When the veggies are roasted, heat a large non-stick pan over medium heat. Add one tortilla, mayo-side up, to the pan. Top with some veggies and mozzarella. Fold the other half of the tortilla over the filling. Cook until golden-brown and crisp, 1-2 min per side. Repeat cooking with remaining tortillas. 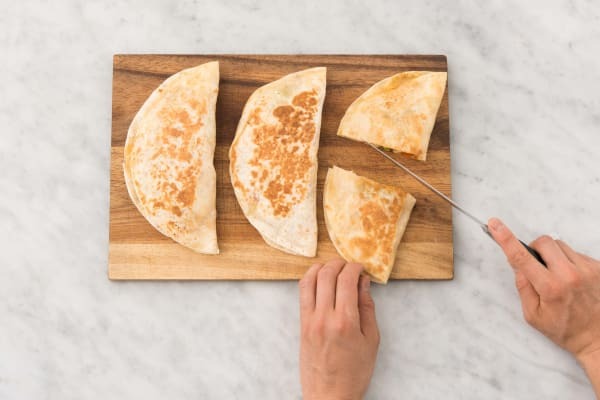 FINISH AND SERVE Cut the warm quesadillas into wedges. Divide the quesadillas between plates and serve with the guacamole.